Welcome back to another installment of boozings, where we try all of Philly’s Top 15 Drinks! 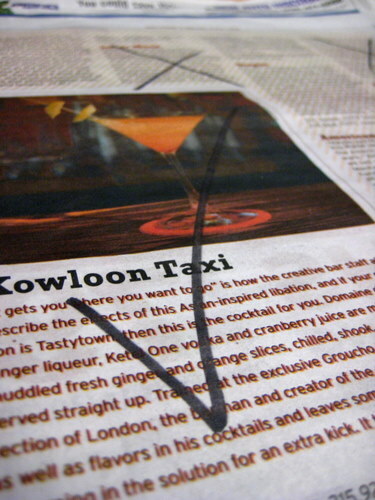 Next up we go to Kong, for the Kowloon Taxi. 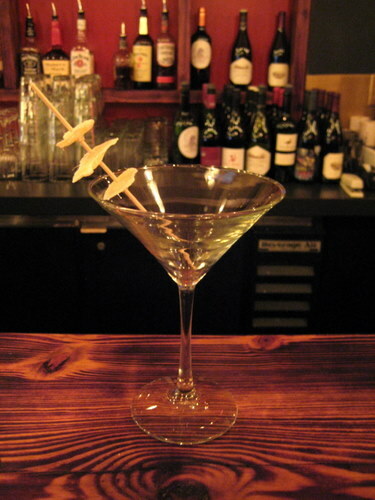 It is concocted with Domaine de Canton ginger liqueur, Ketel One vodka and cranberry juice, mixed with muddled fresh ginger and orange slices, and served straight up in a martini glass, garnished with stirrer full of candied ginger. I was actually dreading having to drink this because I’m not the biggest fan of ginger. I like when ginger is used as a flavoring (ginger powder, crushed / minced ginger), but I don’t actually like it being visible in my food. There’s nothing I dread more than biting into a hunk of ginger. The pickled ginger that comes with sushi? I don’t touch the stuff. That’s why I was so surprised to like this drink. Seriously. This ginger-phobe liked this ginger based cocktail! It’s very gingery and spicy, but not in the campfire way that the chile infused drink was. It’s spicy in the gingery way. And incredibly strong as well. As I kept on drinking it, the ginger flavor became less offensive, and I really started to enjoy it. I still did not like it when I actually bit into a hunk of ginger, which thankfully only happened once. And the candied ginger that came on the stirrer, I even took little bites of that and enjoyed it a little bit. But I still can’t see myself ever just eating candied ginger for fun. I’d never been to Kong before but on this monday night, it was completely deserted, which made me a bit sad. The place is beyond beautiful. 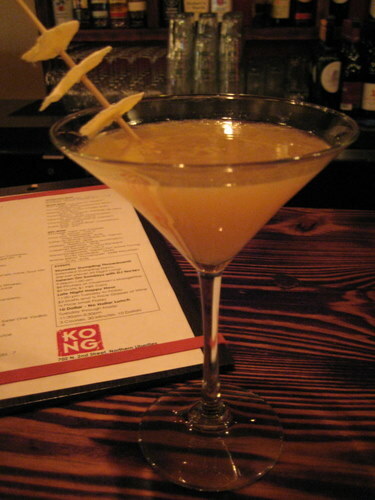 I have read mixed reviews about the food, which is probably why the place was so empty, but perhaps the location in Northern Liberties isn’t the best for a place like Kong. If this place was in chinatown, it would probably be packed every night. Ok, 8 down, 7 more to go!